Every photo and video that gets sync'd to MightyText is PRIVATE by default. We will never share your photo or video content with anyone, without your consent and understanding. Ever. Can I share photos and videos with my friends? 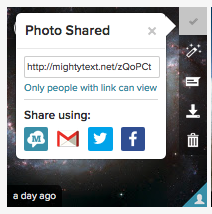 Sharing any photo or video that gets sync'd to MightyText is very easy. Hover your mouse over the photo/video. 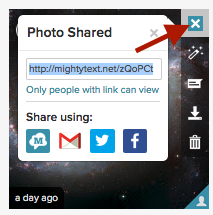 You will see a link that you can share via MMS, email, Twitter, Facebook, etc. Only people who have access to this link can see your content. Can I "unshare" photos or videos? 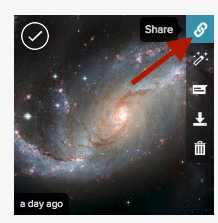 Click the small "x" in the Share button. That photo/video will immediately become private again. Any previously shared link for that content will no longer work.